The launch of the next crew flying to the International Space Station is facing a multi-week delay after a fault was discovered on their Soyuz spacecraft in the late stages of testing at the Baikonur Cosmodrome from where the three-man crew was to launch later this week. The Roscosmos State Corporation announced on Saturday that the launch of Soyuz MS-02 was being delayed for technical reasons, not adding any details on the nature of the problem. The spacecraft was expected to launch on September 23 and complete a two-day rendezvous with the Space Station to bring Sergei Ryzhikov, Andrei Borisenko and Shane Kimbrough to the orbiting complex for a five-month stay. 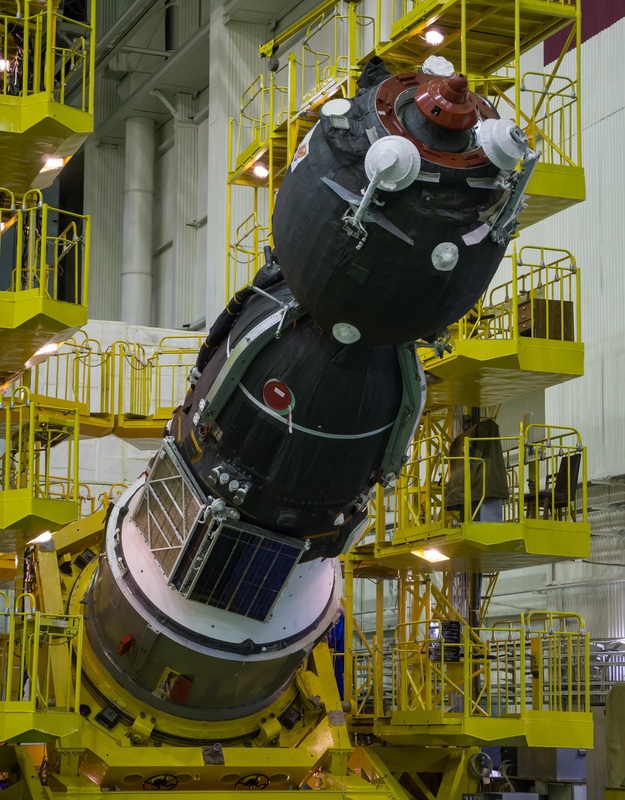 Sources characterized the problem as a ‘short circuit in an unknown electrical system’ that occurred after the Soyuz spacecraft had been encapsulated in its payload fairing last Thursday. 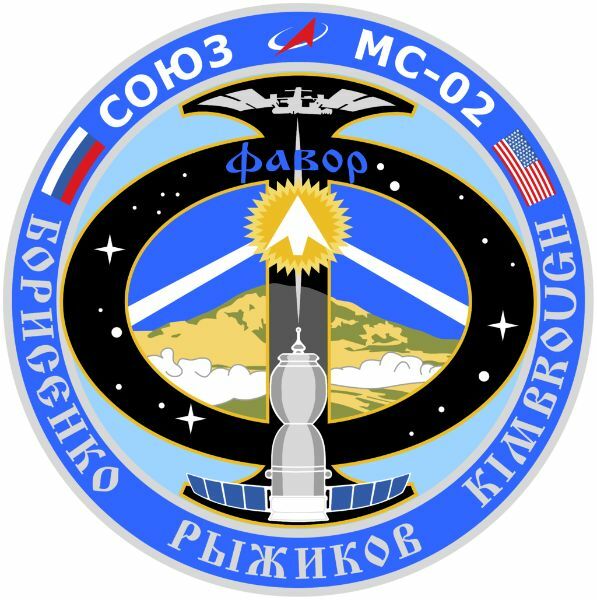 Soyuz MS-02 is just the second in the modified Soyuz MS series to fly, following the launch of Soyuz MS-01 in July. The MS upgrade features changes to a number of electrical systems aboard the spacecraft including more-powerful solar arrays, the introduction of a Unified Command and Telemetry System, the addition of a space-to-space communications system, new rendezvous navigation system and a digital video processing chain. The three Expedition 49/50 crew members arrived at the Baikonur Cosmodrome back on September 8 after completing final training and exams at the Gagarin Cosmonaut Training Center near Moscow. Arriving at the launch site, the three crew members entered the typical two-week launch flow that is in place for all Soyuz missions. 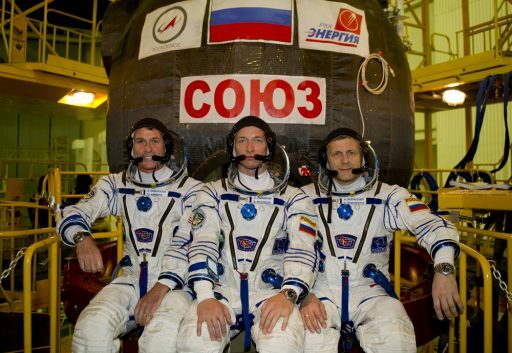 Ryzhikov, Borisenko and Kimbrough visited their Soyuz at the Site 254 processing facility before putting on their Sokol Launch and Entry Suits and conducting a suited ingress exercise as well as a simulation aboard their spacecraft, putting themselves and their vehicle to the test. 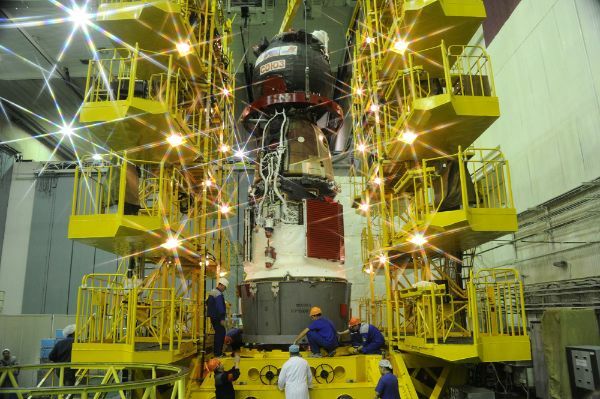 Processing operations proceeded without issue and Soyuz was loaded with over 800 Kilograms of propellant and pressurized gases for its mission before returning to the Processing Facility to be mated to its payload adapter and finally installed in the shroud. Having spent several weeks at the Cosmodrome, the Soyuz completed a number of tests beginning with thermal vacuum checks followed by solar array illumination checks, electrical and Flight Control System testing, as well as specialized tests of the Entry Module. Neither of these tests showed any issues present on the spacecraft. 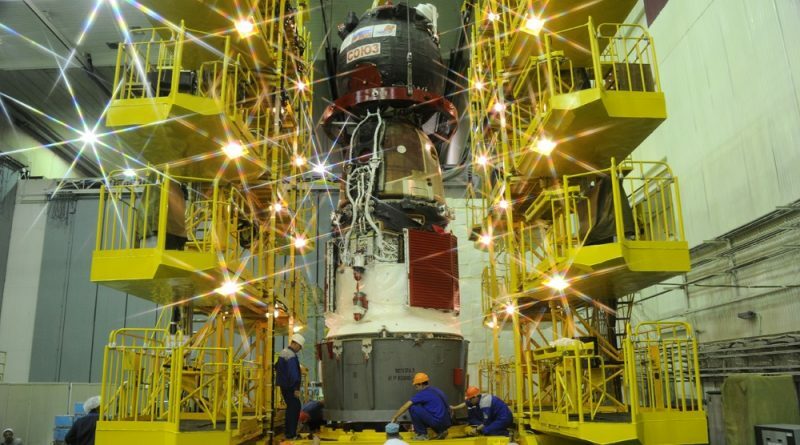 After Soyuz was rotated to a horizontal position and encapsulated in its launch shroud, technicians put electrical connections in place and moved the stack back to an upright configuration for a last integrated test of the Soyuz in its processing facility. This test showed a short present in the electrical system somewhere in the Soyuz-Shroud complex. Because the problem only occurred after installation of the shroud, the initial suspicion was that it was related to systems on the shroud or interfaces between the spacecraft and fairing. 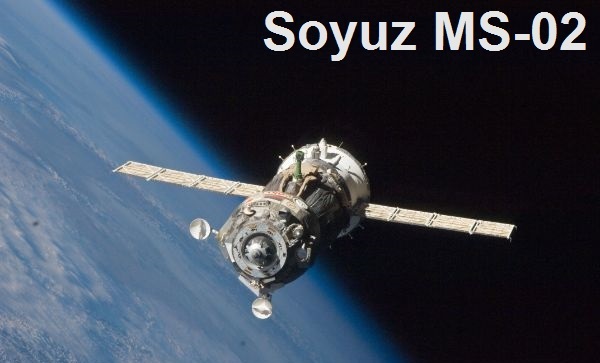 However, according to a report by Interfax, the problem was found to be within the Soyuz spacecraft itself and engineers were not able to localize the fault by Monday morning. According to other press reports, evaluations were underway whether a switch in Soyuz spacecraft would be the most advantageous option. At present, Soyuz No. 732 (originally intended MS-02) is sitting right across from No. 733 (MS-03) at the processing facility since the MS-03 mission was scheduled for launch just seven weeks after MS-02. Per standard operating procedure, a backup vehicle, in this case No. 733, would have to be ready for launch within 45 days of the original vehicle’s target launch date to ensure ISS can remain staffed by at least three crew members. 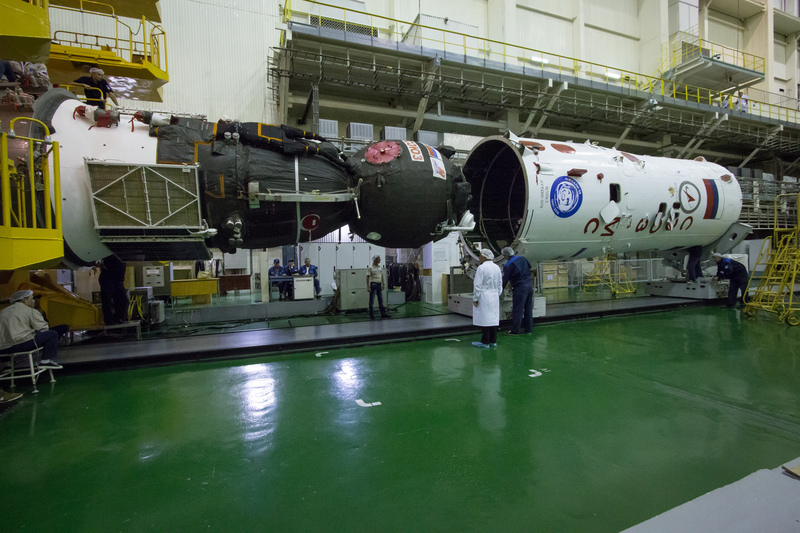 Because Soyuz MS-02 is facing a slip of several weeks, it was decided to fly the crew back to Moscow where they can continue training operations and wait for their ride to space to become available. On Monday, TASS reported that a provisional launch date of November 1 has been set for the Soyuz MS-02 mission – pending review and approval by the Russian State Commission and obviously depending on the resolution of the problem on the spacecraft. In a contrasting report, RIA cites industry sources claiming that further testing has shown no recurrence of the fault and a decision on a firm launch date was expected on Tuesday or Wednesday. A launch date beyond October 30 would mean that current ISS Residents Anatoli Ivanishin, Kate Rubins and Takuya Onishi would receive an extension to their mission since their landing was scheduled for Oct. 30. 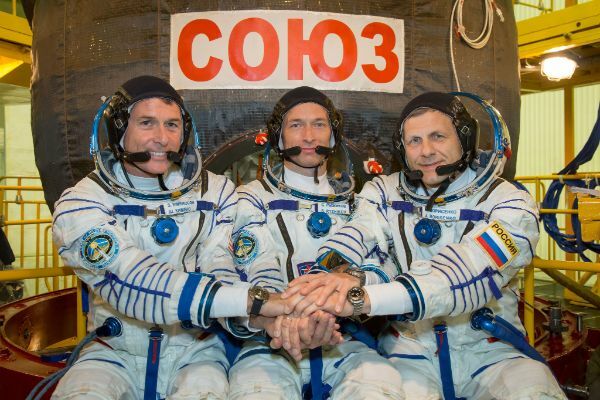 They have been in space since July 7 after encountering a lengthy launch delay due to software problems on the first Soyuz MS spacecraft to take flight. Because of the delay to the MS-01 mission and an earlier delay in the introduction of the improved line of MS spacecraft, the three Expedition 48/49 crew members were only looking at a 115-day mission. Theoretically, Ivanishin, Rubins and Onishi could remain in orbit until early February without violating any Soyuz lifetime concerns – giving teams plenty of time to get at least one Soyuz launched, either 732 or 733, to ensure a continuous human presence on board ISS.